Criteria of Age: For Title A please note that min. 15 year- Max. 24 and min. 15- max 22 years for post B as on 01-07-2015. For PwD & for Ex-Servicemen relaxation of age will be 10 years as per GOI. Hiring Mode: 10th passed ITI certificate in the relevant trade, scores obtained will create the merit list with which candidates will be selected in particular trade. Charges for Application: For General category INR 100/- and for others like SC/ ST/ PH/ Ex-Service Man, Women, Minorities & Economically backward classes no fees will be applicable, the candidate need to attach the proof for category while submitting an application. Application fees will be paid via using DD from Nationalized Bank or Indian Postal Order drawn in favor of FA & CAO, CLW/ Chittaranjan, payable at Chittaranjan. Way to Submit Application: Applications are invited from eligible candidates where candidates are advised to use the format provided only and printout should be taken on A-4 size paper. 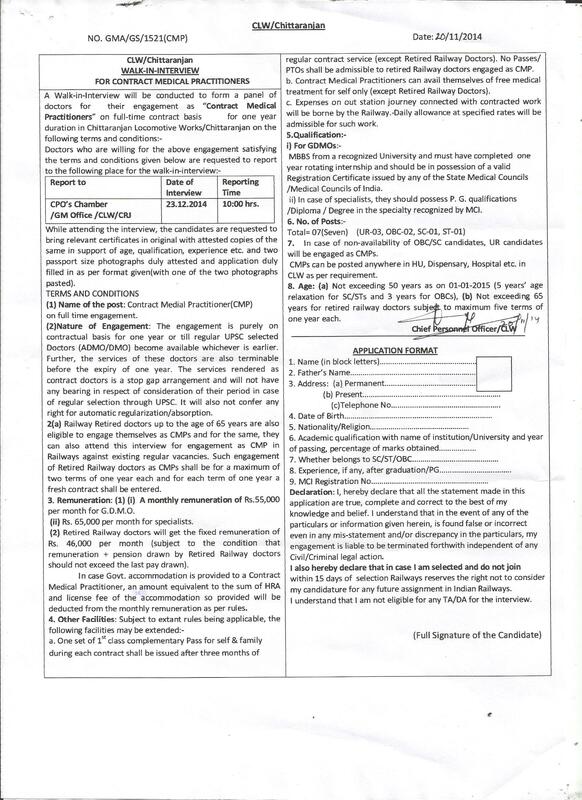 Applicant should paste passport size photograph, cross-signed by the applicant and all documents should be attested through Gazetted Officer, fee, two self-addressed envelopes (size 11″ x 5″) duly affixed with Rs. 5/- postage stamp on each envelope. Applicant must superscribe the envelope as “Application for Training under Apprentice Act”. Closing date for receipt of application: 24-08-2015 up to 05:00 P.M. The application is invited for eligible candidates for Doctors walk in Interview on 23rd December for 7 Posts on Contractual basis. The interview will start at 10.00 AM. Chittaranjan Locomotive Works invited eligible doctors for the walk in interview for recruitment to 07 posts of Contractual Medical Practitioners. The interview is scheduled to be held on 23 December 2014. Candidate should have MBBS Degree for Recognized University with the one-year rotating internship. Before joining he has to produce Registration certificate to board issued by State Medical Councils/Medical Councils of India. Age Limit Not more than 50 years as on 01 January 2015. In case of no availability of OBC/SC candidates, unreserved candidates will be engaged for this posts. unreserved candidates will be engaged for this posts. Posting can be done anywhere in HU, Dispensary, Hospital etc. in CLW as per requirement. Candidate needs to carry the application in prescribed format with all the proofs for education/ Registration by state Government with self-attested copies and two passport size photographs to CPO’s Chamber/GM Office/CLW/CRJ.